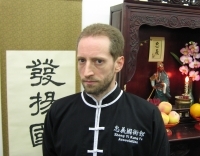 Charles began his martial training under Shifu Ferreira in 2000. A valuable member of ZYKFA's Taolu Team he has succesfully competed in Regional, National and International level championships. He is also a member of ZYKFA's performance troupe and Lei Tai Team. Charles has served as a referee in different traditional Chinese martial arts tournaments and became a ZYKFA Instructor in November of 2012.